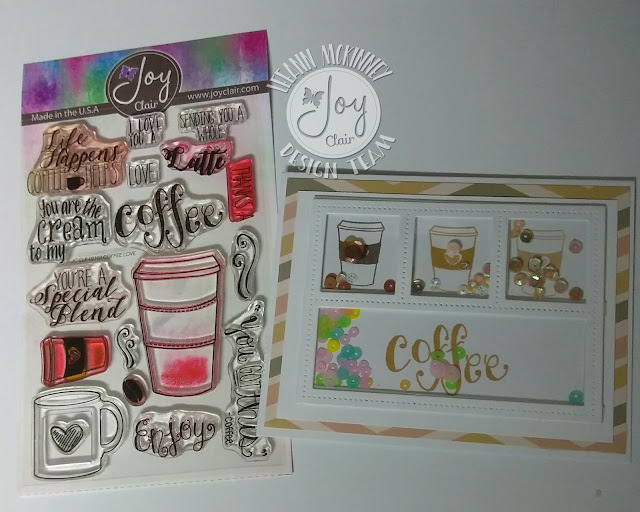 I used Super Sponsor Joy Clair Stamps Coffee Lovers themed stamp set to make this shaker card. Using 3 different inks GinaK Dark Chocolate, GinaK HoneyMustard and PowderPuff Latte I stamped the three small coffee cups. I also stamped the word Coffee in the Honey Mustard. Using sequins from Kat Scrappiness in Caramel Latte, Espresso, Australian Gold and Spring mixes I filled my windows. I Used Couture Creations 3D foam Shaker Card Adhesive Strips to adhere the die cutout to the background page, and Kaisercraft double-sided tape to adhere acetate to the die cut. My Chevron Layer is made using a K&Company Paperpad from 2015. I hope you have enjoyed my card. I will be back later today with another. What a fabulous shaker card! So super creative and fun. Thanks so much for sharing this in the Coffee Loving Cardmakers Spring Blog Hoo. It's so nice to have you share your talents, and I appreciate the inspiration. Love the coffee window panel with cute shaker sequins! Love your fun shaker card, great card! LeeAnn I love this coffee card! Love the coffee colored and spring colored sequins in your awesome shaker card! Such an adorable shaker! That set is on my "wish list"...now that I've seen your card, it may need to move into my "cart"! Love all your fun shaker panels. So fun. Great coffee shaker card! So CAS and lovely!! Fantastic shaker design. I seldom make them but I do admire them. Great card. Love the boxes.